Are Humidifiers Good or Bad for your Allergies? Humidifiers are devices that can be used to increase and eventually maintain the humidity levels in the atmosphere to avoid the discomfort from the effects of dry air. They work by spraying steam or water vapor in the atmosphere to increase the relative percentage of moisture in the atmosphere. How does Dry air affect allergies? & How Humidifier helps? Is a humidifier good for allergies? What are the types of Humidifiers available? When the moisture levels in the atmosphere drop to lower than 50 percent, then it may create uncomfortable conditions leading to discomfort and issues like dry skin, chapped lips and hair, skin rashes and infections, respiratory problems, allergies, etc. Dry air absorbs a major part of the moisture from your nasal passage leaving it up all dry and irritated hence aggravating your allergies and leading to conditions like sore throat, bloody nose and other respiratory ailments. To nullify this effect of dry air on the respiratory tract, the body tends to increase the mucus production further leading to Asthmatic like situations. Also allergens like pollen tend to travel more in warm and dry air further affecting your allergies. Now comes the question that how does a humidifier help? 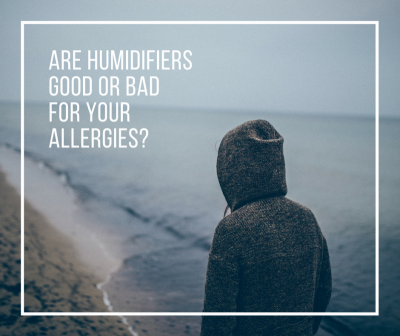 Well, humidifiers tend to increase the humidity levels in the atmosphere and maintain it to an optimum level so that the nasal passage does not get all dried up and lead to excessive mucus formation. This further helps in keeping the allergens like mold, bacteria, etc. affecting your allergies, away from your body. Moist air is also responsible for protecting your skin from infections, skin rashes, etc. by keeping it all moisturized and healthy and can help you in avoiding health issues like cold and cough, sinus infections and allergic reactions. These types of humidifiers spray a mist at room temperature in the atmosphere. A Cool mist evaporative humidifier uses an internal wick filter and fan in its processing. The wick filter absorbs the water and the fan blows the air through the filter while a cool mist ultrasonic humidifier uses a unique technology of ultrasonic vibrations to create and spray a micro-fine cool mist in the environment. They consume less electricity than the warm mist humidifiers as the heating element required to warm the water is not required. The only drawback for such type of humidifiers is the sound that they make because of the fan. Such types of humidifiers use a heating element to boil the water and spray the warm mist in the environment. By boiling the water, they somehow sterilize the water hence preventing the waterborne bacteria and mold from spreading into the atmosphere. They are less noisy in operation but hold the disadvantages of consuming more electricity, being difficult to clean and the risk of burns from the warm mist to children. They are the combination of both Warm and Cool mist humidifiers with advantages of being extremely quiet, providing anti-bacterial protection and the choice of opting for the preferred humidification method.